COMIC STORY ARC: A New Era Begins! It is a busy evening for Batman and the night is not over as of yet. The caped crusader is jam-packed with the villainess catwoman and her antics of thievery. Catwoman emotes jealousy even while in battle, as she sniffs Batman who is reeking of Chanel no.5. Captain Gordon is set in an environment of corruption and deceit at the Gotham City prescient. The police force of Gotham city is not to be trusted. The captain is stand offish with the temperament of cops and the recent police commissioner of Gotham. Alfred the original sidekick of Batman uses his pleasantries and his debonair butler skills to cover the tardiness and the late arrivals of Mr. Bruce Wayne to keep a date with the lovely Ms. Malone. Yes the cowled avenger has a rough evening ahead of him. The detective instincts or the radar of his bat ears are afoul with the deaths of two young gothamnites. The two were brutally mauled and there is a curious distinction between them; no traces of blood in both bodies. The incredible dark story written and drawn by Matt Wagner is a rollicking good read. This mini-series starts with a new adventure and subplots from the first mini-series: Batman vs. the Monster Men. Matt Wagner depicts the dark knight as a detective primarily, which is good to read and view his detective instinct instead of fisticuffs. Do not get me wrong, the plethering of fist and good ole punches to the noggin are still plentiful and exciting to view. The atmosphere of the panels puts the reader under a good serial spell from the days of movie cinema at the Saturday afternoon matinee. This exciting series is a necessary read for any Batman fan. Uniquely presented and undeniably filled with thrills and chills. 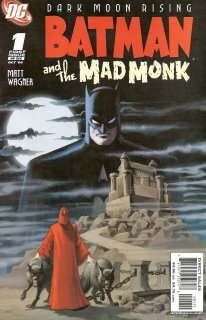 Could the Mad Monk be the predecessor of the Red Hood? Find out in the exciting series Batman and the Mad Monk. Although there are so many titles depicting Batman, I think this is the purest of the old time sleuthing of the Batman. All this and more is in the first issue of the six part series: Batman and the Mad Monk. This title is deserves an Inqusitive rating of Five!